Our Luxurious North Lake Tahoe Vacation Lodge awaits your arrival, within walking distance to North Lake Tahoe Beaches and about 7 minutes’ drive to Northstar, this vacation getaway is sure to become a favorite. North Lake Tahoe Vacation Lodge will make you feel at home, the moment you step inside, with an open concept living/dining/ kitchen area and high-end furnishings and finishes, this will be the place you’ll want to come back to, year after year. This home sleeps 8 and is perfect for two families with kids traveling together, or a group of friends joining in, its reversed floor plan has the master bedroom on the main floor along with the master bath; on the floor below, you’ll find the guest bedroom with a queen and the 3rd bedroom set-up with a queen bed and a bunk with 2 singles, a full bathroom is also there to be shared. 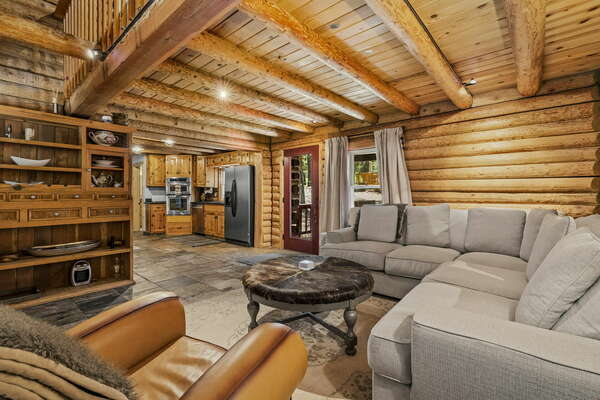 Cook an elaborate dinner in the beautiful new kitchen, relax by the fireplace, or with a book on the back deck, this serene house will be the perfect home away from home on your Tahoe vacation. The eat-in kitchen is right off the living room, with lots of cabinets and all appliances, along with a breakfast nook that seats 4. Its dining table seats 6. The kitchen and dining space are open to the living room, so you can enjoy everyone’s company. Or take your feast to the back deck, the choice is yours. It’s vacation! Located in the upper Kings Beach, North Lake Tahoe Vacation Lodge will become your year round vacation home base. Bring your beach toys if visiting in the summer, North Lake Tahoe Things To Do all around; golfing gear, Brockway Golf Course within 3 minutes’ drive; there is plenty of hiking, mountain biking and just exploring. Winter brings on a whole new range of activities, with North Lake Tahoe Skiing and Snowboarding only 7 minutes away, ski, snowboard, snowshoe, ice-skate or just snow play.